The referee was Arturo Jota. It was the 25-year old Jr. featherweight Juarez’ (19-5, 14 KO) second straight on Sunday Manila Time at the Auditorio Municipal in Cabo San Lucas, Baja California, Mexico. The more accurate Juarez largely dominated the energetic second round. Using his height edge, Juarez landed right hands over the top and again stunned Pumicpic near the ropes with a left hook. It continued in similar fashion for the next few rounds. 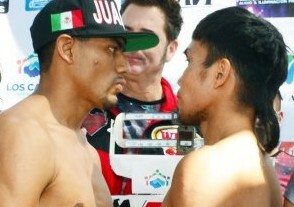 Juarez was landing more but Pumicpic stayed in the fight, firing back, sometimes wildly, and attacking the body. A clash of heads drew blood on the forehead of Juarez but it didn’t appear to affect his vision. Both men continued to fight hard the rest of the way but even with a spirited effort, the most Pumicpic could accomplish was to last the distance. Final scores came in at 95-93, 96-93, and 98-91, all for Juarez. Juarez builds on the momentum of his previous outing, a surprising knockout of undefeated Albert Pagara in July, and a rousing if losing effort against Nonito Donaire in 2015.